Eagle feathers are worn in the hair of this Plains Indian. 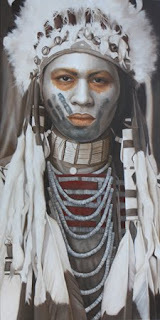 His face is painted with white clay and he wears a striped Blanket. 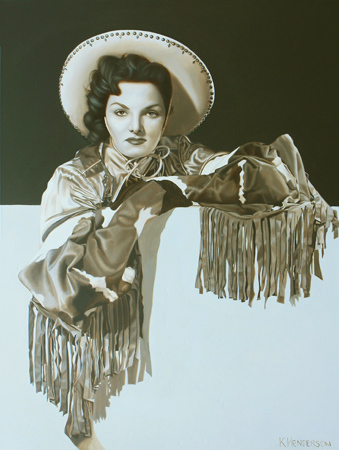 This Cowgirl oil painting is my most recent in my Silver Screen Cowgirl series. Don't you love those crazy fringed cowhide cuffs? I can't get enough of the retro cowgirl style. I love Western Movies especially those with Classy Cowgirls. The sepia tone brings back the feeling of the Saturday Matinee western serial. 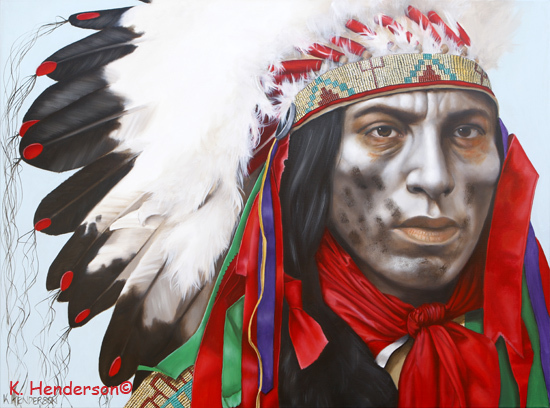 This Plains Indian Warrior is glancing behind. He wears honors from past battles. 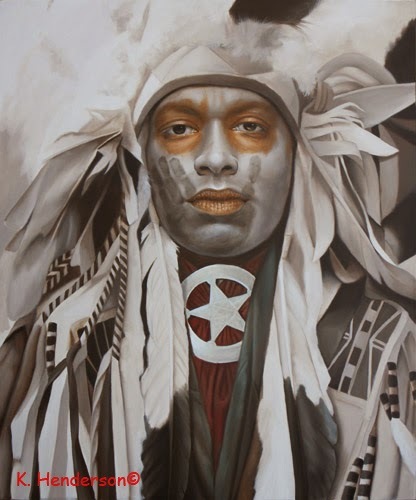 Each eagle feather represents a brave deed and the hand painted on his face tells of an act of courage. And now for something completely different. This is the 3rd in a series of paintings using the logo of the Indian motorcycle. 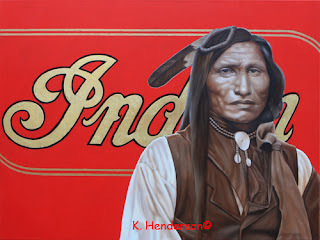 I was inspired by a red gas tank with gold lettering. 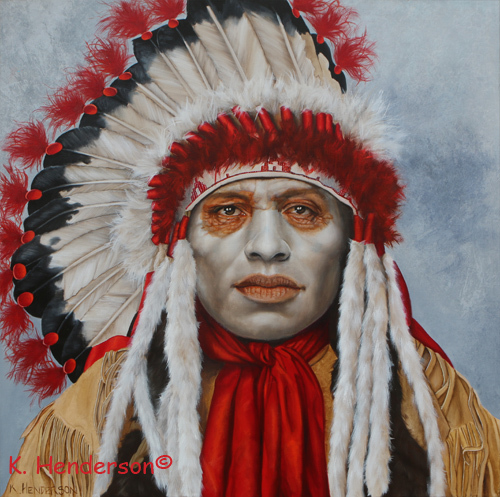 I like the contrast between the bright contemporary background and the more traditional and subdued colors of the American Indian figure. The size of this painting is a brand new format for me. I hope you like it. This Plains Indian wears a bonnet of feathers, beads, bells, ermine tails and trade cloth. 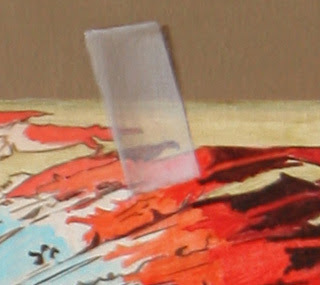 His face is painted white with a black Coup Mark (hand). The regalia is completed with a beaded shirt and 2 shell necklaces. 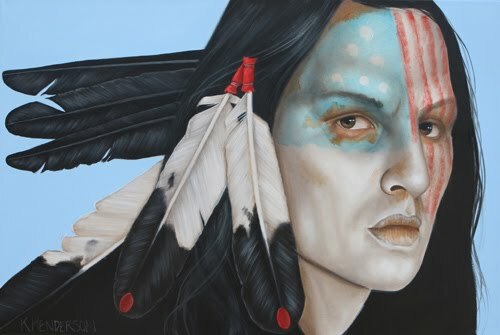 Receiving and Eagle Feather is the highest mark of Respect. 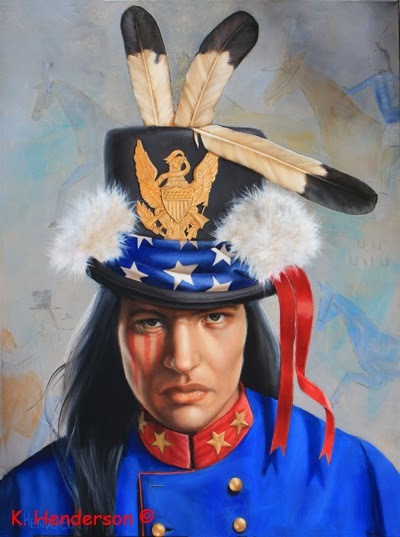 The feather must be earned through acts of courage and honor. 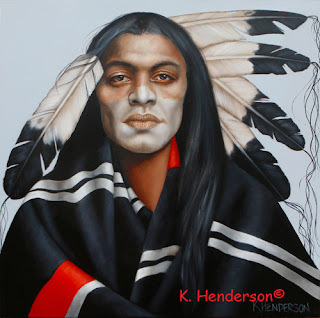 Each Feather in a headdress represents the wearers accomplishments. Eventually, items were made expressly for the purpose of trading. Around the mid 19th century these items were made from "German Silver", an inexpensive silver-white alloy containing copper and zinc and nickel. 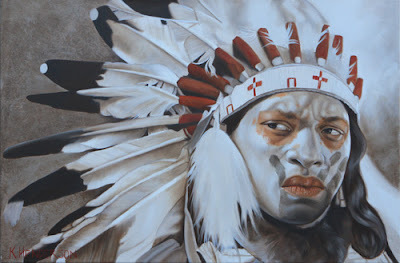 This Plains Indian wears a feathered headdress with ermine tails. His face is painted white . 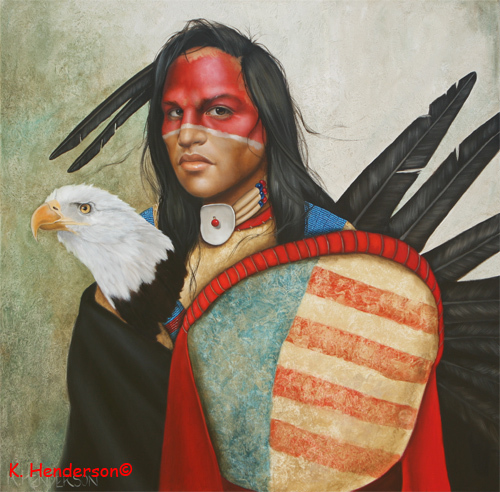 Moves Like the Wind is oil on linen, 30" x 30"
It depicts a Plains Indian holding a shield and a eagle dance wand. His face is painted Red and white. 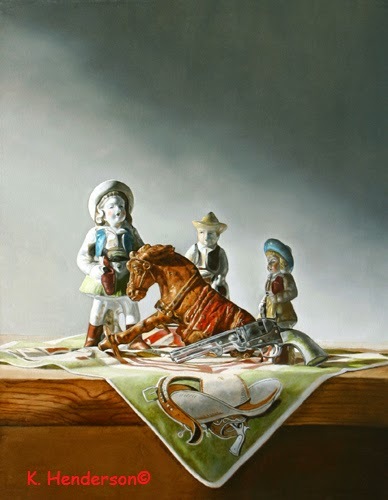 The title of this painting comes from the song written by Woody Guthrie. 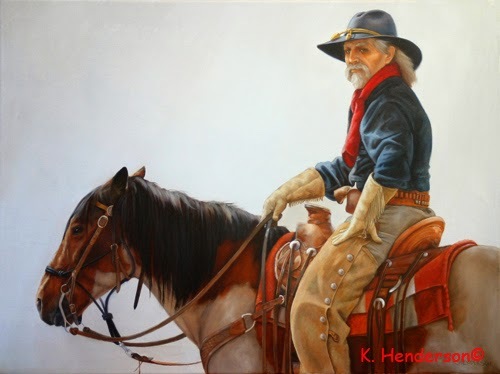 This is another painting from my 1880's Cowboy Series. 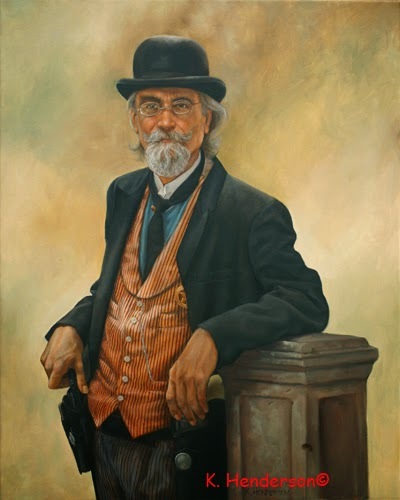 This shows a typical City Slicker wearing a derby, silk vest pocket watch and a frock coat. And of course, a pair of Six Shooters. 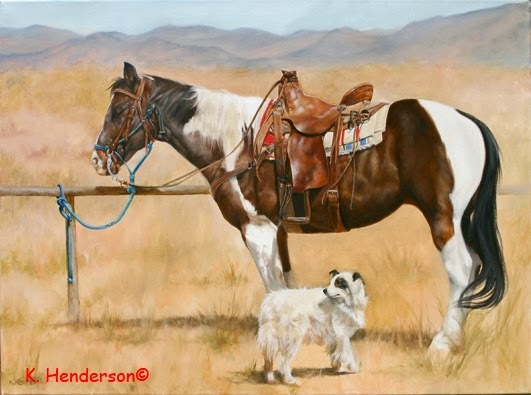 Redwing is 30 x 24, oil on canvas. This painting shows a mixture of old and newer icons of the American Indian. 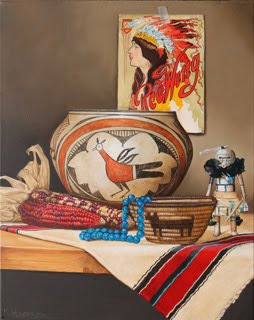 There is pottery, corn, beads, blanket, a kachina as well as a turn of the century piece of sheet music "Redwing". 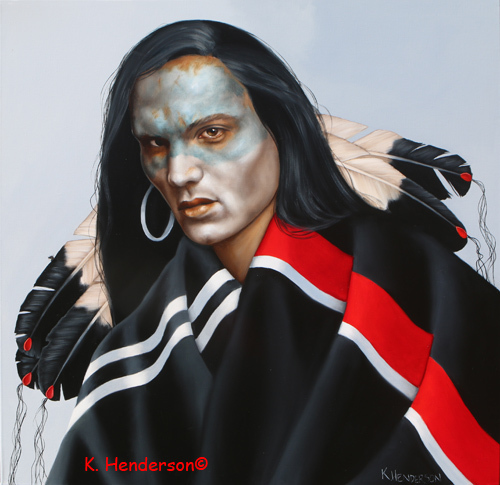 This painting was awarded second place at the Hubbard Museum's Biennale Grande in Ruidoso, NM.